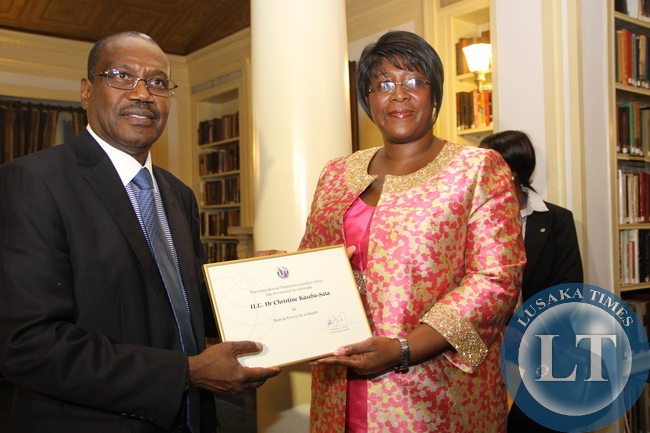 Government conveys its congratulations to First Lady Dr Christine Kaseba-Sata on being honoured as the first Special Envoy of Electronic Health (e-health) by the International Telecommunication Union, ITU, at the ongoing 69th United Nations General Assembly in New York, United States of America. This recognition adds to the growing list of international accolades the First Lady has, and continues to receive, for her passion, love and selfless service, above and beyond the normal call of duty, particularly in championing the welfare and wellbeing of women and children. Government notes with pride that In May last year, the First Lady received a Frontline Award from the Global Coalition on Health in recognition of her work in women and children health issues. The Coalition also recognised her work in reproductive health, cervical cancer, and her efforts to improve maternal health. The First Lady was also conferred with an Honorary Fellowship Award for her professional work as an Obstetrician-Gynaecologist at the 61st 2013 American Congress of Obstetricians and Gynaecologists (ACOG) Annual Clinical Meeting. In September 2012, the First Lady was honoured with the Global Leadership of Excellence Award by the Cancer Foundation – Susan G Komeni. 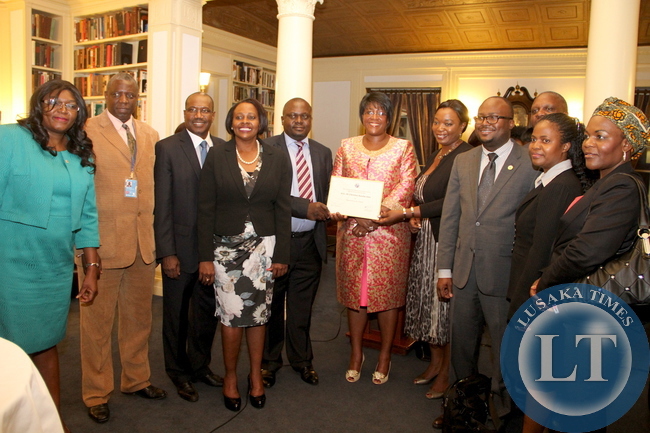 The Award recognised the exemplary personal commitment of Dr. Kaseba–Sata in the fight against cervical cancer in Zambia. Government deeply appreciates such noble works as they are in tandem with its agenda to improve people’s quality of life. Government also conveys its appreciation to the ITU for the honour it has bestowed on the First Lady, and through her, the country as a whole, by designating her as its First Special Envoy on e-health. I re-affirm Government’s commitment to working closely with the ITU in developing the ICT sector as a vehicle for delivering quality health care and other social and economic services to the people of Zambia. My son received a certificate ,also in a university library like the first lady can I send the picture for the media to publish also? ….I’m wondering why the hullabaloo for every little certificate awarded probably influenced by virtue of being first lady. Thank God ,someone gave her the message of bu chiseke- seke. Christine is hardworking and smart, not like ba Maureen. Lies, she is killing the husband slowly for her own publicity?? apart from her talking and Tour of Duties?? Nothing tangible has come from her hands?? so how do you classify her as hard working?? that’s why Africa will always be behind in that it’s all about impressing the leg in state house. she is nothing but an embarrassment. Where is Ndobo, can you see my shirt here on left?? Ba Kabanshi invited me. Ba kwesu, nothing intimate about this latest relationship. Fyachabe chabe ifma awards fyakwa First Lady, e-health! Come on-when we have our mothers giving birth on floors of UTH? Thrash Metal take your ignorance elsewhere. You are not a doctor. nurse,physiotherapist etc who care for patients with a smile despite the difficulties at UTH. YOU ARE NOT IN THE NOBLE PROFESSION WERE LIVES ARE SAVED! Dr.Kaseba is bringing awareness to health care issues through her appointments at the UN. Dr Kaseba knows first hand how patients suffer due to limited resources at UTH. Dr Kaseba has used her brain to SAVE LIVES AND TEACH STUDENT’S TO SAVE LIVES! Thrash Metal take your ignorance elsewhere. You are not a doctor, nurse,physiotherapist etc who care for patients with a smile despite the difficulties at UTH. YOU ARE NOT IN THE NOBLE PROFESSIONS WERE LIVES ARE SAVED! Dr.Kaseba is bringing awareness to health care issues through her appointments at the UN. Dr Kaseba knows first hand how patients suffer due to limited resources at UTH. Dr Kaseba has used her brain to SAVE LIVES AND TEACH STUDENTS TO SAVE LIVES! Congratulations Madam first lady, Dr. C. K. Sata. You deserve the honor.